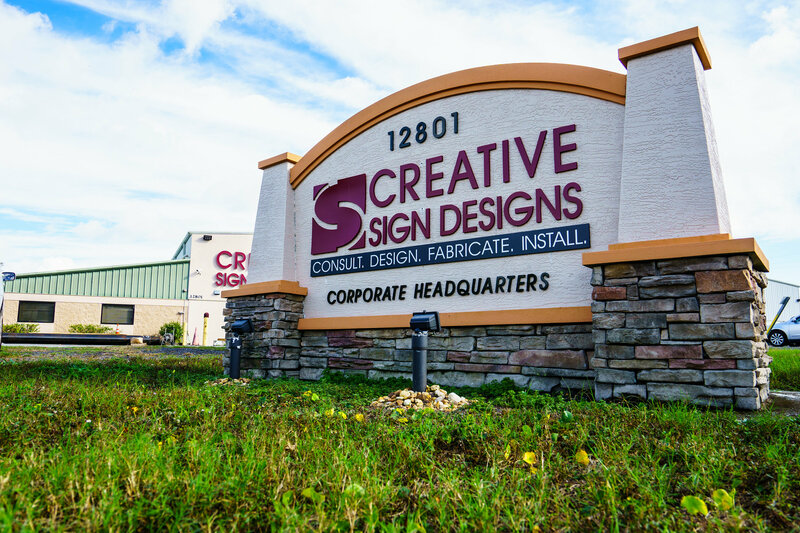 As a custom sign manufacturer, Creative Sign Designs brings a high level of dedication to every sign project. Clients are welcome to visit the 50,000 square-foot, sign manufacturing facility to fully grasp the capabilities and view the latest in sign design and manufacturing technology. Creative’s headquarters was designed and constructed to ensure the highest level of efficiency, quality and safety for employees, and a work flow that can accommodate any project. As a custom sign manufacturer, Creative utilizes computerized sign making equipment that enables better service and higher quality products. All of this combines to create the kind of results that clients expect from an industry leader! Recognized as a leading custom sign manufacturer, Creative Sign Designs has assembled a roster of the finest machinery, tools and equipment available. The utilization of computerized designs, cutting and fabrication technology allows Creative to achieve a consistent and excellent product on every project. Having access to state-of-the-art machinery and technology enables clients to experience cost savings, shorter delivery time, and product quality that rank among the best in the industry.